This front-wheel-drive vehicle is well-known in the industry for being an easy-to-use, reliable, powerful-engined cargo van usually used for business purposes. 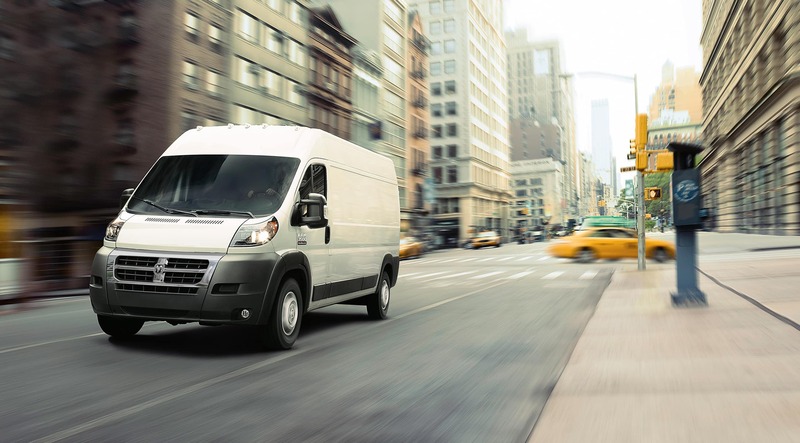 The ProMaster is RAM's candidate for the Class 2 full-size van segment. It has several configurations with or without side/back windows, a low load floor height, and either a high or low ceiling. 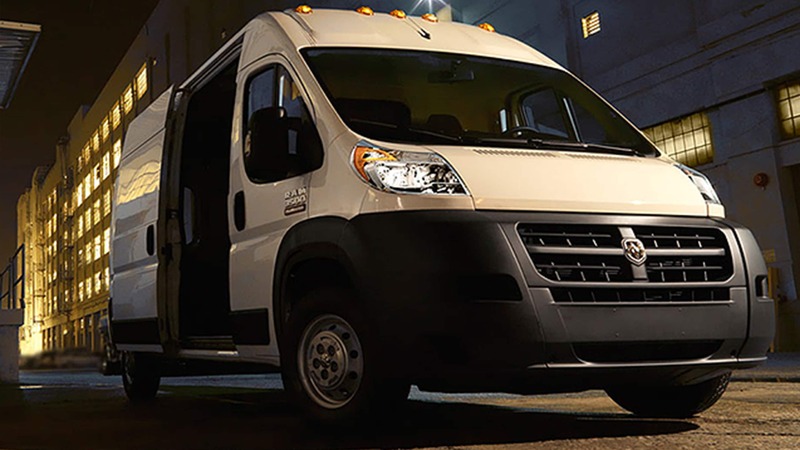 The 2018 Ram ProMaster is a large commercial van that slots above the smaller ProMaster City. 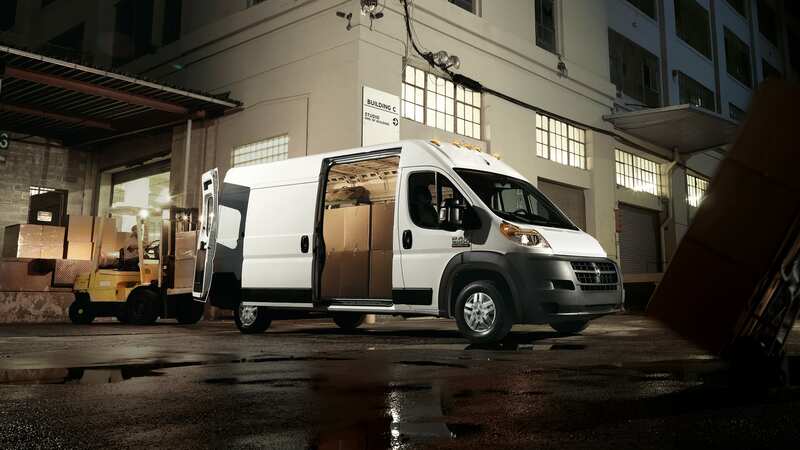 There are no trim levels but instead, the 2018 RAM ProMaster does supply drivers with 3 wheelbase lengths, which is important when considering the trade or business needs you have. The design is FWD-only and that leaves much more room under the body of the vehicle, compared to its RWD rivals, as well as assists in keeping traction in adverse road conditions like snow and ice. What can power this vehicle? 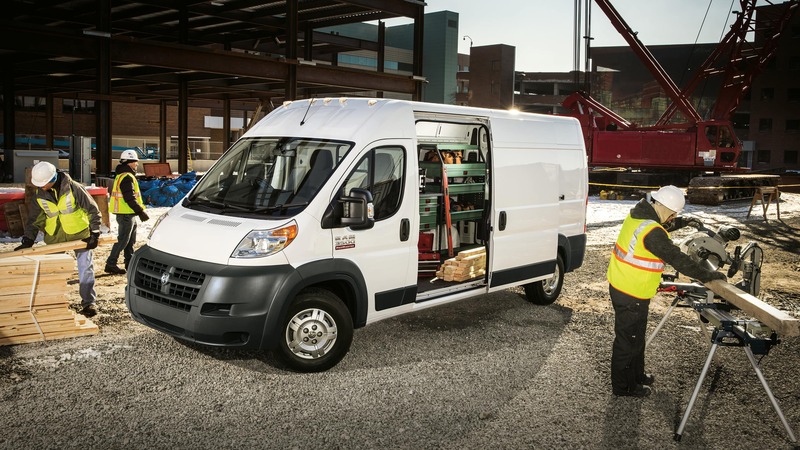 The 2018 Ram ProMaster comes with two engine choices, a 3.6-liter V-6 with 280-hp and 260 lb-ft of torque or a 3.0-liter turbodiesel I-4 rated at 174 hp and 295 lb-ft. An AutoStick 6-speed automatic is the only transmission available with the 3.6-liter V-6 while the diesel comes with a six-speed automated manual. When properly equipped with a trailer, all variants of the 2018 Ram ProMaster can tow up to 5,100 pounds and can carry a payload between 3,470- and 3,990-lbs (depending on engine & body style)! 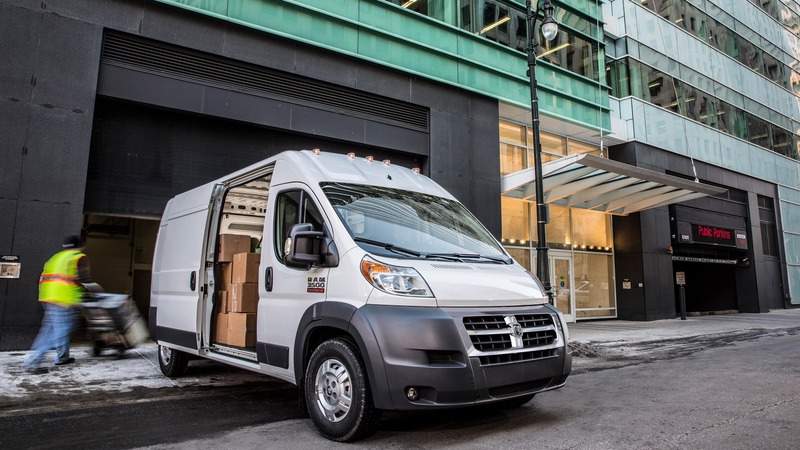 What features and capacities make the 2018 RAM ProMaster great? 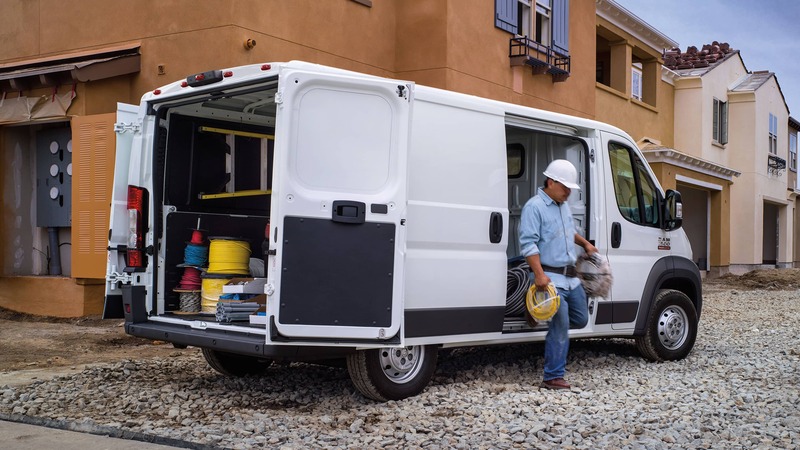 The ProMaster cargo van comes standard with a USB port, Bluetooth, keyless entry, manual 4-way seats, a UConnect infotainment system with a 5-inch touchscreen, 16" steel wheels, and a rearview camera. 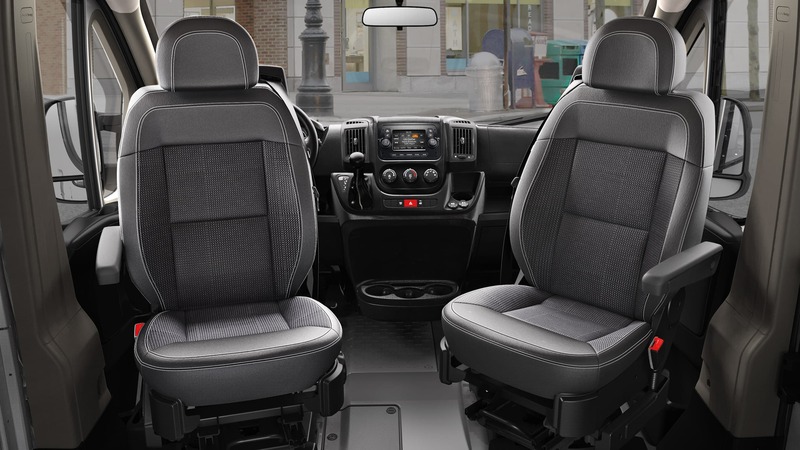 Available choices to add in extra are, among other things, parking sensors, navigation, a remote start, a leather-wrapped steering wheel, Driver/Passenger 6-way adjustable seats, aluminum wheels, power side mirrors, a Wood Composite floor, and side windows. 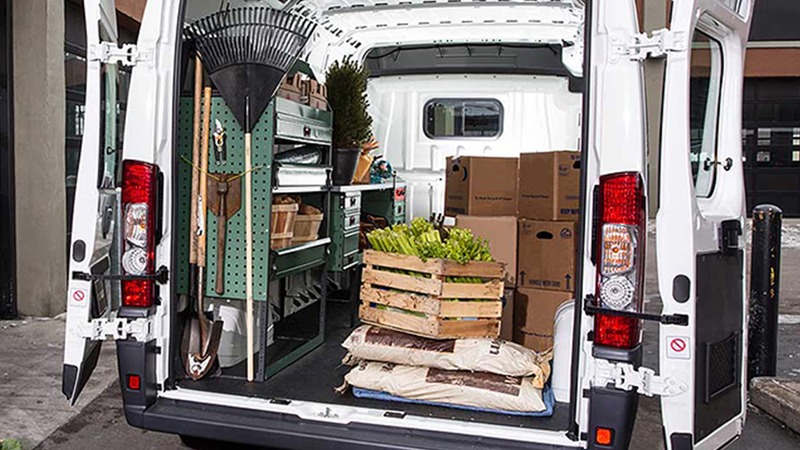 The ProMaster 1500 short-wheelbase version rocks an excellent 259 cubic feet of cargo volume, while the medium-wheelbase has a cargo volume of 304 cubic feet (low roof) or up to 353 cubic feet (high-roof). There are options for LED light bars in the cargo area, window grates, SiriusXM Sat Radio w/ 1-Yr Radio Subscription, a rear bumper-step extension, a chrome grille (standard in Dark Gray), and rear-hinged doors with deep tinted glass. Can you talk about the Packages for a moment? Certainly, and there are several Packages to consider, depending on your needs. There is, of course, the Trailer Tow Package with its '7 and 4' Pin Wiring Harness and a Class IV Receiver Hitch. Then there is a Premium Appearance Group that incorporates front fog lights and a chrome grille. Following that there is exists an Interior Convenience Group which installs a cargo net, locking glove box, under-seat & overhead storage, and even an A-pillar document holder which is especially useful to those using this for their business fleet. 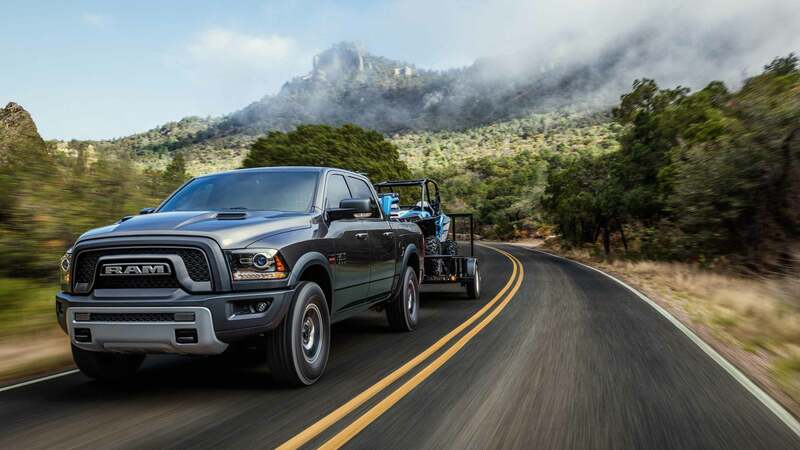 Certain van configurations allow the MOPAR Interior Cargo Rack Package, which has a cargo rack, as you might imagine, but that in itself is incredibly helpful for those who need it-- most who get it come to rely on it very heavily. Let's talk safety a second, which this van was designed with in mind, since most who use it are not only driving a large portion of the day, but also unloading/loading in high-traffic areas. The airbag-laden 2018 RAM ProMaster adds in functions such as standard All-speed traction control, which detects and manages wheel slippage by judiciously enacting brake pressure to the slipping wheel and sends torque to the wheels with the best traction. 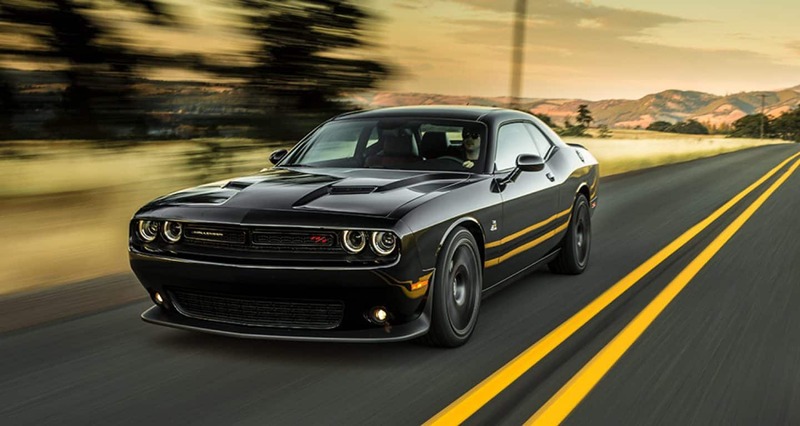 For those of you concerned about your employee's driving, there is a standard dealer-activated speed limiter that sounds a reminder when passing a speed that you pre-set, as well as an optional electronic vehicle tracking system. Electronic Roll Mitigation and Hill Start Assist also appear as standard, as does the ParkView Rear Back-Up Camera, a TPMS (Tire Pressure Monitoring System), Traction Control, and Remote Keyless Entry! 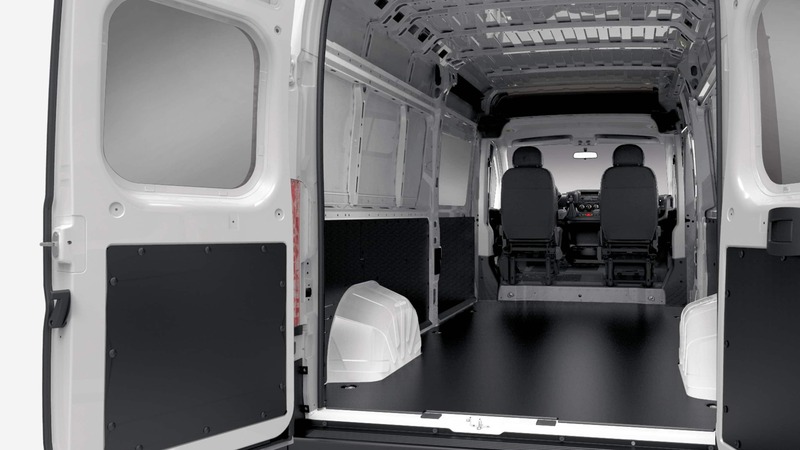 This is such a well-rounded van, with several variations to best suit your demands-- it's hard to ignore its integral place in the worlds of deliveries and tradespeople. Maybe now is the time to contact us about it!